HOW TO JOIN THE MPNCA!!! The Mt. Paran-Northside Citizen Association is open to all those residents living in the neighborhood. The very important and nominal annual dues pay for and provide access to the neighborhood's private security patrol team operated by off duty Atlanta police officers. These amazing police officers conduct out-of-town house checks daily, patrol our streets in a REAL APD police car paid for and donated by a group of MPNCA members. , and save many people false alarm fees. The hours devoted to security patrol are directly related to the dues collected...the more members we have the more hours of security we receive! This is one reason why your membership is so very important. All members have access to an online directory and can become part of a private MPNCA Members group within Nextdoor where important updates and information is posted. The association also hosts an annual neighborhood social held in a neighbor's private home or neighborhood venue. For those residents renewing your membership please login to your online account on this website to pay your annual dues online. For first time members who cannot access their online account or if you are new to the neighborhood please email me at membership@mtparannorthside with all of your contact information (name, email address, home address, phone number, cell phone number). Once I receive your information, I can then put you into the system and you will be able to pay online and start receiving our emails. Your annual dues are $250.00. There is a small fee for paying online through PayPal (which you do not have to actually sign-up for to pay). It is most important that you include an email address. This is how the Association keeps you updated and informed. 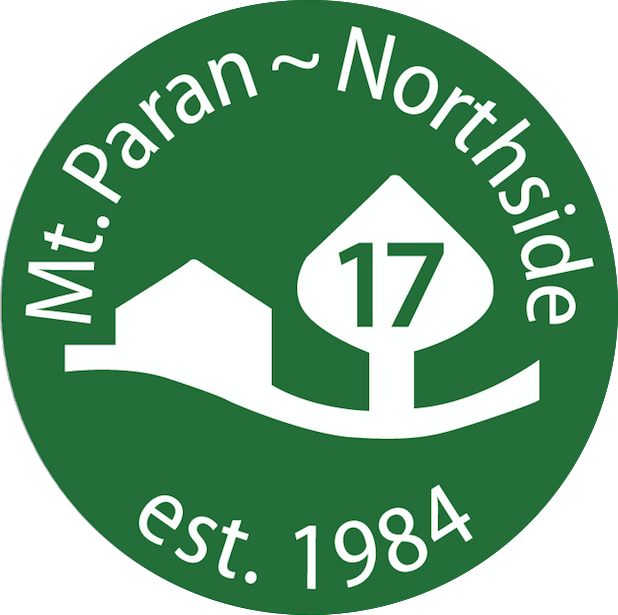 Safety, traffic, beautification and government affairs have kept the Mt-Paran-Northside Citizens Association busy for three decades as our area continues to grow. It is essential that we grow our membership base to include all homes, allowing us to expand our security patrol and better respond to our community's needs. Let 2018 be the year of 24/7 security. It is possible with your help! Atlanta could retain and recapture many senior residents by passing a school tax exemption. A consequence of senior flight is an increased burden on younger residents to pay growing infrastructure bills. Seniors residents with school tax exemptions would continue to pay city and county property taxes. Seniors mean money. Surrounding counties understand the economic value of seniors. Two seniors equal one job. Each senior generates $59,517 annually in direct and re-spending. Thus, 1,000 seniors would increase the Atlanta City GDP by $59 million annually and add 500 jobs. Estimates comparing surrounding metro counties that have senior school tax exemptions indicate Atlanta is losing $32.6 million in tax revenues and fees by not having a senior school tax exemption. Many Atlanta politicians refuse to address this issue for fear of retaliation from APS. Atlanta’s present building boom is increasing revenue collection dramatically. In response, Atlanta City adjusts the millage down. APS does not adjust. Atlanta seniors can forget aging in place with family and caring for grandchildren. Atlanta is not competitive. In fact, Atlanta is Senior Unfriendly and losing. 1. Between June 2nd through 4th, a cement mixer was stolen from the 4100 block of Conway Valley Road. 2. Please remember to call 911 first if you see any suspicious activities or to report a crime. You are the police’s eyes and ears. Then, call the Mt. Paran Security Patrol line at 404-538-8946. 3. If you are going out of town, then please text 404-538-8946 or email security@MtParanNorthside.com with your house check details. When requesting a house check, please leave your gate code, dates you will be leaving and returning, cell number, anyone that will be visiting the home while you are gone, whether mail is stopped or needs to be collected, etc. in the email or text to security. 4. Please be mindful of locking your doors and not leaving valuables in your car. Furthermore, please remember to set your house alarms even if you are only going to be gone for a short time. 5. Just a friendly reminder that it is not uncommon to see an increase in crime during summer months. This is not to alarm you. It is to remind you to please use our out of town service while you are gone, make sure to hold your mail and packages or have your neighbor collect those items for you, and set your house alarm regardless the amount of time you will be gone. 6. A special Thank You to Major Shaw of Atlanta Police Department, Zone 2, and Captain Rose of the Sandy Springs Police Department for additional patrols in our neighborhood during the I-85 bridge collapse. Even though they were overwhelmed with traffic demands, they graciously honored our request for additional patrols due to the safety concerns our members had about the additional traffic in our neighborhood. Thank You!! 1. On or about May 15th, a gas line was hooked up to the wrong side of the resident’s gas meter on the 800 block of Davis Drive. 2. On or about May 20th, a Burglary occurred on the 900 block of Buckingham Circle. Nothing was taken. The home is and has been on the market for sale. 3. On or about May 26th, a theft of lawn equipment occurred on the 1500 block of Cave Road. 4. On or about June 1st, a mailbox was damaged on the block of 1000 W. Conway Drive. Please note our security patrol is not on duty 24/7, and we do not want to discourage you from calling 911. Furthermore, false alarms are a bit tricky in how they are coded with 911 so although security does not want you to incur a false alarm fee, there is not a clear process for them to follow to help prevent it completely. 1. Give the alarm company the Patrol phone number and have them call it after attempting to get in touch with you. a. If you do not answer and Patrol is not on duty (patrol doesn't answer) have them call 911.
b. If the alarm company calls and you answer, then tell them to call 911.
c. Then, you Call Patrol phone after that if we are on duty we will handle it. d. Then, You Call the alarm company back and cancel alarm. This is why it is so important for us to have all of your contact numbers. Please don't provide a house phone when you going to be out of town or not home. If we hear the alarm over the radio, then we can call you on our way so you can call alarm company and cancel it so you do not get charged. 6. Please remember to check your mail daily and be alert. If you suspect mail theft or fraud, then please contact the U.S. Postal Service. 7. Please remember to call 911 first if you see any suspicious activities or to report a crime. You are the police’s eyes and ears. Then, call the Mt. Paran Security Patrol line at 404-538-8946. 8. If you are going out of town, then please text 404-538-8946 or email security@MtParanNorthside.com with your house check details. Please do not use the .org email anymore. DO NOT call the security line for house check details unless you do not have the capabilities to text or email. When requesting a house check, please leave your gate code and cell number in the email or text to security. 9. Please be mindful of locking your doors and not leaving valuables in your car. Furthermore, please remember to set your house alarms even if you are only going to be gone for a short time. 10. Just a friendly reminder that it is not uncommon to see an increase in crime during summer months. This is not to alarm you. It is to remind you to please use our out of town service while you are gone, make sure to hold your mail and packages or have your neighbor collect those items for you, and set your house alarm regardless the amount of time you will be gone. 1. No reported crime in our neighborhood this week! Woo-hoo! 3. Please remember to check your mail daily and be alert. If you suspect mail theft or fraud, then please contact the U.S. Postal Service. 4. Please remember to call 911 first if you see any suspicious activities or to report a crime. You are the police’s eyes and ears. Then, call the Mt. Paran Security Patrol line at 404-538-8946. 5. If you are going out of town, then please text 404-538-8946 or email security@MtParanNorthside.com with your house check details. Please do not use the .org email anymore. DO NOT call the security line for house check details unless you do not have the capabilities to text or email. When requesting a house check, please leave your gate code and cell number in the email or text to security. 6. Please be mindful of locking your doors and not leaving valuables in your car. Furthermore, please remember to set your house alarms even if you are only going to be gone for a short time. 7. Happy Memorial Day weekend to you all. I will not be sending out a report on May 28th. I will report again on June 4th. 8. Just a friendly reminder that it is not uncommon to see an increase in crime during summer months. This is not to alarm you. It is to remind you to please use our out of town service while you are gone, make sure to hold your mail and packages or have your neighbor collect those items for you, and set your alarms regardless the amount of time you will be gone. 7. Happy Mother’s Day to all! For more MPNCA news click here. Sally Riker, our MPNCA Traffic Chair, has reported that I-85 will reopen by Monday! We are very grateful for the speedy repairs. MPNCA Car Magnet...LIMITED TIME ONLY! Show your neighborhood unity and get an official MPNCA Car Magnet while you still can. For the members who order a magnet now, you will get an updated "year" sticker every year with your membership renewal. Don't forget to order multiples for all of your cars! NEW MPNCA Car Magnet Only $5! Pre-order your official MPNCA car magnet today! All proceeds will go toward extra security hours for our neighborhood. Once you have your magnet, the yearly sticker to replace the "17" will be automatically sent to you through the mail upon membership renewal. Please consider joining this great endeavor that one of our neighbors and past MPNCA President, John Gordon is spearheading!